and the documentation on https://github.com/greatspn/SOURCES. This webpage describes the old GreatSPN2.0. GreatSPN2.0 is a software package for the modeling, validation, and performance evaluation of distributed systems using Generalized Stochastic Petri Nets and their colored extension: Stochastic Well-formed Nets. The tool provides a friendly framework to experiment with timed Petri net based modeling techniques. It implements efficient analysis algorithms to allow its use on rather complex applications, not only toy examples. GreatSPN2.0 is composed of many separate programs that cooperate in the construction and analysis of PN models by sharing files. Using network file system capabilities, different analysis modules can be run on different machines in a distributed computing environment. The modular structure of GreatSPN2.0 makes it open to the addition of new analysis modules as new reserch results become available. All modules are written in the C programming language to guarantee portability and efficiency on different Unix machines. All solution modules use special storage techniques to save memory both for intermediate result files and for program data structures. Several state-of-the-art analysis prototypes have been recently added in the package: an algorithm for the fast computation of performance bounds based on linear programming techniques, working at a purely structural level (the computed bounds depend only on the average firing delay of the transitions while they do not depend on the p.d.f. of such delays); algorithms for the analysis of Stochastic Well-formed Nets providing the user with the possibility of designing models of complex systems in a more compact way, and allowing a more efficient state space analysis that automatically exploits the model symmetries (through the Symbolic RG concept). Furthermore, the graphical interface has been recently ported under OSF Motif achieving high portability under different hardware platforms. G. Chiola, R. Gaeta, A. Horvath, M. De Pierro, M. Beccuti, S. Baarir, D. Cerotti, Elvio Amparore. New interesting developments on the solvers for the SWN formalism, based on some core functions of GreatSPN for the handling of SWN models, are in progress within a collaboration with the group MoVe (resp. Prof. F. Kordon) of the LIP6, Universite' Marie Curie, Paris and within a collaboration with the CReSTIC laboratory (resp. Prof. P. Moreaux) of the Universite' de Reims Champagne-Ardenne (URCA), Reims. graphical model editing including layering, cut and paste, selection, rotation, rescaling, spline, zooming, improved printing in PostScript, etc. Markovian solvers for steady-state as well as transient performance evaluation exploiting efficient, sparse matrix numerical techniques. interactive simulation, with graphical animation of the model and movement of tokens, with step-by-step, and automatic run, forward and backward time progression, real time update of performance figures, arbitrary rescheduling of events. The simulation state is periodically saved on a file, so that previous simulation runs can be resumed at any time. Several probability distributions are allowed for transition timings (including uniform, discrete, Cox, Erlang, etc.). The following items are Now Available!! The package is available for free for universities and non-profit organizations, while it can be purchased from the Dipartimento di Informatica, Università di Torino (Italy) by other organizations/companies. The procedure to obtain it is the the following. Send either by electronic mail (greatspn@di.unito.it) or by fax the name and the Internet address of the machine you will use to connect to our server. Upon their receipt we will send you an e-mail message containing all the necessary information to retrieve the source code of the package and its documentation. Follows a list of GSPN and SWN model examples: for each example it is possible to download a zip file containing a description of the modeled system (.pdf), the model files in GreatSPN format (.net and .def), some result files produced by GreatSPN (e.g. symbolic reachability graph of SWN models - .srg* files - performance indices computed by GreatSPN - .sta files -, etc.). A README file is included to explain the content of each file in the package. G. Chiola, G. Franceschinis, R. Gaeta, and M. Ribaudo. GreatSPN 1.7: Graphical Editor and Analyzer for Timed and Stochastic Petri Nets. Performance Evaluation, special issue on Performance Modeling Tools, 24(1&2):47--68, November 1995. Compositionality in the GreatSPN tool and its use to the modelling of industrial applications. S. Bernardi, C. Bertoncello, S. Donatelli, G. Franceschinis, G. Gaeta, M. Gribaudo and Horvàth. GreatSPN in the new Millenium. In Tools of Aachen 2001, International Multiconference on Measurement, Modelling and Evaluation of Computer-Communication Systems, Research Report no.760/2001, Universitat Dortmund (Germany), September 2001, pages 17--23. J.M. Ilie, S. Baarir, M. Beccuti, C. Delamare, S. Donatelli, C. Dutheillet, G. Franceschinis, R. Gaeta, P. Moreaux. Extended SWN Solvers in GreatSPN. M. Beccuti, D. Codetta-Raiter, G. Franceschinis, and S. Haddad. A framework to design and solve Markov Decision Well-formed Net models. Proceeding of 4th International Conference on Quantitative Evaluation of SysTems (QEST07), Edinburgh, Scotland, 16-19 September 2007.IEEE Computer Society Press. S. Baarir, M. Beccuti, G. Franceschinis. New solvers for asymmetric systems in GreatSPN. S. Baarir, M. Beccuti, D. Cerotti, M. De Pierro, S. Donatelli and G. Franceschinis. The GreatSPN Tool: Recent Enhancements. ACM Performance Evaluation Review Special Issue on Tools for Performance Evalaluation, Volume 36, Issue 4, September 2009, Pages 4--9. J. Babar, M. Beccuti, S. Donatelli, and A. Miner. GreatSPN Enhanced with Decision Diagram Data Structures. M. Beccuti, S. Haddad, G. Franceschinis. MDWNsolver: a framework to design and solve Markov Decision Petri Nets. International Journal of Performability Engineering, Volume 7, Issue 5, September 2011, Pages 417-428. Ed. RAMS Consultants. M. Ajmone Marsan, G. Balbo, and G. Conte. A class of generalized stochastic Petri nets for the performance analysis of multiprocessor systems. ACM Transactions on Computer Systems, 2(1), May 1984. M. Ajmone Marsan, G. Balbo, G. Conte, S. Donatelli, and G. Franceschinis. 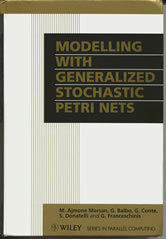 Modelling with Generalized Stochastic Petri Nets. J. Wiley, 1995. G. Chiola, J. Campos, J.M. Colom, M. Silva, and C. Anglano. Operational analysis of timed Petri nets and applications to the computation of performance bounds. In Proc. 5th Intern. Workshop on Petri Nets and Performance Models, Toulouse, France, October 1993. IEEE-CS Press. G. Chiola, C. Dutheillet, G. Franceschinis, and S. Haddad. Stochastic well-formed coloured nets for symmetric modelling applications. IEEE Transactions on Computers, 42(11):1343--1360, November 1993. G. Chiola, M. Ajmone Marsan, G. Balbo, and G. Conte. Generalized stochastic Petri nets: A definition at the net level and its implications. IEEE Transactions on Software Engineering, 19(2):89--107, February 1993. R. Gaeta, and G. Chiola. Efficient simulation of SWN models. In Proc. 6th Intern. Workshop on Petri Nets and Performance Models, Durham, U.S.A., October 1995. IEEE-CS Press. G.Chiola, C.Dutheillet, G.Franceschinis, and S.Haddad. A Symbolic Reachability Graph for Coloured Petri Nets. Theoretical Computer Science B (Logic, semantics and theory of programming), 176 (1&2):39-65, April 1997, Elsevier. M.Ajmone Marsan, S.Donatelli, G.Franceschinis, and F.Neri. Reductions in Generalized Stochastic Petri Nets and Stochastic Well-formed Nets: An Overview and an Example of Application. L. Capra, C. Dutheillet, G. Franceschinis, J. M. Ilie. Towards Performance Analysis with Partially Symmetrical SWN. S. Baarir, C. Dutheillet, S. Haddad, and J-M. Ilie. On the use of exact lumpability in partially symmetrical Well-formed Nets. In Proc. of QEST, pages 23-32,Torino - Italy, September 2005. M. Beccuti, S. Baarir, G. Franceschinis, J-M. Ilie. Efficient lumpability check in partially symmetric systems. G. Balbo, M. Beccuti, M. De Pierro and G. Franceschinis. First Passage Time Computation in Tagged GSPNs with Queue Places. The Computer Journal, Oxford University Press., Volume 54, Issue 5, May 2010, Pages 653-673. On the importance of token scheduling policies in Stochastic Petri nets. S. Baarir, M. Beccuti, C. Dutheillet, G. Franceschinis, S. Haddad. Lumping partially symmetrical stochastic models. International Journal of Performance Evaluation, Volume 68, Issue 1, January 2011, Pages 21-44. Proceedings of Winter Simulation Conference (WSC12), pages 296-296, Berlin, Germany, 9-12 December, 2012. In Proc. 7th International Workshop on Petri Nets and Performance M odels, St. Malo, France , june 1997. Volume 1420 of LNCS, Proc. of 19th International Conference on Application and Theory of Petri Nets. Springer-Verlag, June 1998. M. Beccuti, A. Bottrighi, G. Franceschinis, S. Montani and P. Terenziani. Modeling clinical guidelines through Petri Nets. In 12th International Conference on Artificial Intelligence in Medicine (AIME'09), volume 5651 of Springer LNCS, pages 61-70. July 18-22, 2009, Verona, Italy.